I’ve been with AWS for four and a half years. I started as a one of the first mid-market territory Solution Architects in Sydney, then I moved to professional services doing security, risk, and compliance. For the last year, I’ve been the security lead for Well-Architected, which is a global role. It’s a framework that contains best practices, allowing you to measure your architecture and implement continuous improvements against those measurements. It’s designed to help your architecture evolve in alignment with five pillars: Operational Excellence, Security, Reliability, Performance Efficiency, and Cost Optimization. The framework is based on customer data that we’ve gathered, and learnings that our customers have shared. We want to share these learnings with everyone else. Basically, I listen to customers a lot. I work with specialists and service teams around the world to help create security best practices for AWS that drive the Well-Architected framework. My work helps customers make better cloud security decisions. I’ve been developing some in-depth, hands-on training material for Well-Architected, which you can find on GitHub. It’s all open-source, and the community is welcome to contribute. We’re just getting started with this sort of hands-on content, but we’ve run AWS-led sessions around the globe using this particular content, including at our AWS Security Lofts throughout the USA — plus Sydney, London, and Singapore — and we’ve gotten very positive feedback. Everyone has different priorities and opinions on security. What a Singapore financial startup thinks is a priority is completely different from what an established bank in London thinks — which is completely different from the entertainment industry. The priorities of startups often center around short time-to-market and low cost, with less focus on security. I’m trying to make it easy for everyone to be what we call Well-Architected in security from the start, so that the only way to do something is via automated, repeatable, secure mechanisms. AWS is great at providing building blocks, but if we can combine those building blocks into different solution sets and guidance, then we can help every customer be Well-Architected from the beginning. Most of the time, it doesn’t cost anything additional. People like me just need to spend the time developing examples, solutions, and labs, and getting them out there. Cloud security is an opportunity to rethink cybersecurity — to rethink the boundaries of what’s possible. It’s not just a security guard in front of a data center, with a big, old-fashioned firewall protecting the network. It’s a lot deeper than that. The cloud lets you influence security at every layer, from developers all the way to end users. Everyone needs to be thinking about it. I had a big presentation earlier this year, and I asked the audience, “Put your hand up if you’re responsible for your organization’s security.” Only about a quarter of the audience put their hands up. But that’s not true — it’s everyone’s responsibility. The cloud provides opportunities for businesses to innovate, improve their agility and ability to drive business value, but security needs to go hand-in-hand with all of that. What’s the biggest issue that you see customers struggling with when it comes to cloud security? A lot of customers don’t think about the need for incident response. They think: I don’t want to think about it. It’s never gonna happen to me. No, my access keys will never be lost. It’s fine. We’ve got processes in place, and our developers know what they’re doing. We’re never gonna lose any access keys or credentials. But it happens, people make mistakes. And it’s very important for anyone, regardless of whether or not they’re in the cloud, to be prepared for an incident, by investing in the tools that they need, by actually practicing responding to an incident, and by having run books. If X does happen, then where do I start? What do I need to do? Who do I need to communicate with? AWS can help with that, but it’s all very reactive. Incident response needs to be proactive because your organization’s reputation and business could be on the line. In your opinion, what’s the biggest challenge facing the cloud security industry right now? I think the biggest challenge is just staying up to date with what’s happening in the industry. Any company that develops software or tools or services is going to have a predefined plan of work. But often, security is forgotten about in that development process. Say you’re developing a mobile game: you’d probably have daily agile-style stand-ups, and you’d develop the game until you’ve got a minimum viable product. Then you’d put it out there for testing. But what if the underlying software libraries that you used to develop the game had vulnerabilities in them, and you didn’t realize this because you didn’t build in a process for hourly or daily checking of vulnerabilities in the external libraries you pulled in? Keeping up-to-date is always a challenge, and this is where the cloud actually has a lot of power, because the cloud can drive the automated infrastructure combined with the actual code. It’s part of the whole dev ops thing — combining infrastructure code with the actual application code. You can take it all and run automated tools across it to verify your security posture and provide more granular control. In the old days, nearly everyone had keys to the data center to go in and reboot stuff. Now, you can isolate different application teams to different portions of their cloud environment. If something bad does happen, it’s much easier to contain the issue through the segmentation and micro-segmentation of services. Five years from now, what changes do you think we’ll see across the security landscape? I think we’re going to see a lot of change for the better. If you look at ransomware statistics that McAfee has published, new infection rates have actually gone down. More people are becoming aware of security, including end users and the general public. Cyber criminals go where the money is. This means organizations are under increasing pressure to do the right thing in terms of public safety and security. For ransomware specifically, there’s also nomoreransom.org, a global project for which I was the “Chief Architect” — I worked with Europol, McAfee, and Kaspersky to create this website. It’s been around for a couple years now, and I think it’s already helping drive awareness of security and best practices for the public, like, don’t click on this phishing email. I co-presented a re:Invent presentation on this project few years ago, if you want more info about it. Tell us about the chalk talk you’re giving at re:Invent this year. The Well-Architected for Security chalk talk is meant to help customers get started by helping them identify which best practices they should follow. It’s an open QA. I’ll start by giving an overview of the Well-Architected framework, some best practices, and some design principles, and then I’ll do a live Q&A with whiteboarding. It’ll be really interactive. I like to question the audience about what they think their challenges are. Last year, I ran a session on advanced web application security that was really awesome because I actually got a lot of feedback, and I had some service team members in the room who were also able to use a lot of feedback from that session. So it’s not just about sharing, it’s also listening to customers’ challenges, which helps drive our content road map on what we need to do for customer enablement in the coming months. Your second re:Invent session, the Security Framework Shakedown, says it will walk you through a complete security journey. What does that mean? This session that Steve Laino and I are delivering is about where you should start in terms of design: How to know you’re designing a secure architecture, and how the Cloud Adoption and Well-Architected frameworks can help. As your company evolves, you’re going to have priorities, and you can’t do everything right the first time. So you’ll need to think about what your priorities are and create your own roadmap for an evolving architecture that becomes continually more secure. We’ve got National Australia Bank co-presenting with us. They’ll share their journey, including how they used the Cloud Adoption Framework to get started, and how they use Well-Architected daily to drive improvement across their platform. Broadly, what are you hoping that your audience will take away from your sessions? What do you want them to do differently? I want people to start prioritizing security in their day-to-day job roles. That prioritization means asking questions like, “What are some principles that I should include in my day to day work life? Are we using tools and automation to make security effective?” And if you’re not using automation and tools, then what’s out there that you can start using? Get out there and socialize. Talk to your peers, and try to find some mentors in the community. You’ll find that many people in the industry, both in AWS and among our customers and partners, are very willing to help you on a personal basis to develop your career. Any tips for returning attendees? Think about your goals, and go after that. You should be willing to give your honest feedback, too, and seek out service team members and individuals that have influenced you in the past. You’re from Adelaide. If somebody is visiting your hometown, what would you advise them to do? The “Mad March” festivities should not be missed. If you like red wine, you should visit the wine regions of Barossa Valley or McLaren Vale — or both. My favorite is definitely Barossa Valley. 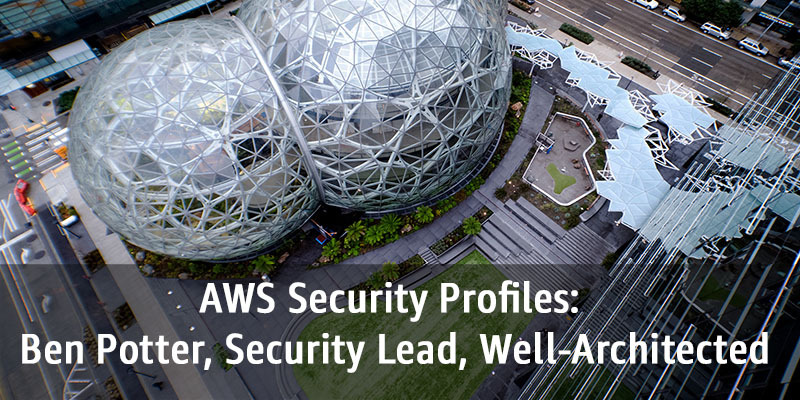 Ben is the global security leader for the AWS Well-Architected Framework and is responsible for sharing best practices in security with customers and partners. Ben is also an ambassador for the No More Ransom initiative helping fight cyber crime with Europol, McAfee and law enforcement across the globe.